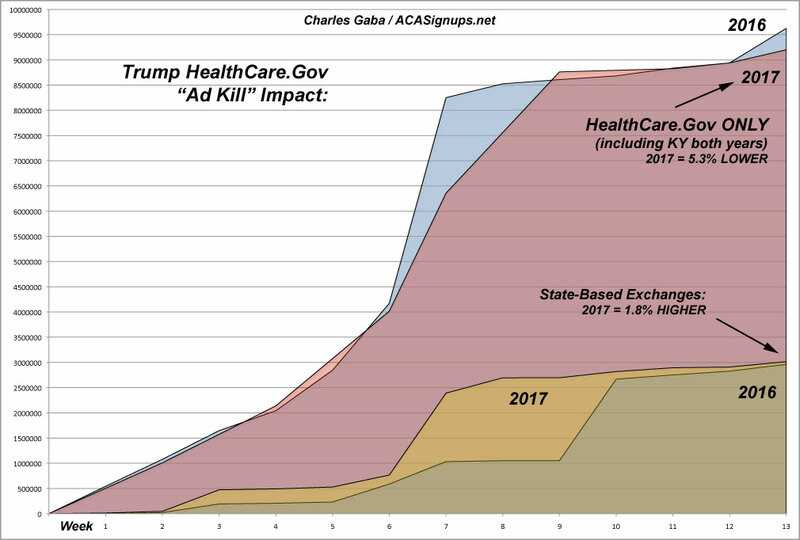 Home » Blogs » Charles Gaba's blog » Trump Slashing HealthCare.gov Advertising This Fall by 90%. Here's What That Looks Like. To recap: Enrollment on the federal exchange was running neck and neck, or even slightly ahead of 2016's Open Enrollment Period, right up until the final week (the discrepancies in Weeks 7 & 8 are due to the timing of autorenewals being different this year)...right up until the final week, when instead of the usual last-minute surge, there was only a nominal bump, resulting in a net decrease of 5.3% year over year. But wait, you say, perhaps that was to be expected; maybe the normal "last-minute shopper" crowd was simply turned off by the premium hikes this year? If the 5.3% drop was consistent across every state I'd say you might be right...but look at the performance of the 12 state-based exchanges...which have their own branding, marketing campaigns and advertising budgets. 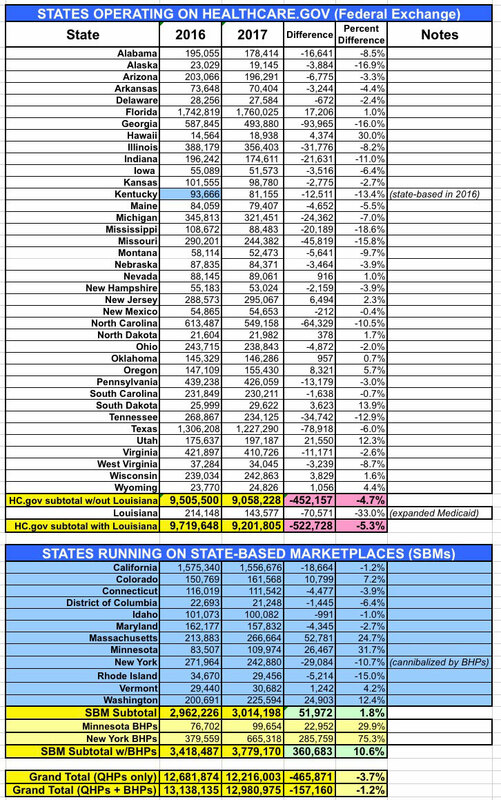 In those states, 2017 enrollment increased by 1.8% year over year...and that doesn't even account for the fact that New York's Basic Health Plan program, which ramped up bigtime this year, effectively cannibalized several hundred thousand potential exchange enrollees. If you include BHP enrollees in NY and Minnesota, the state exchanges saw a net increase of 10.6% over last year. Alternately, if you disregard New York altogether, the other 11 states saw a net increase of 3%. In short, I'm pretty sure that if the Trump Administration hadn't yanked advertising and issued "Obamacare is dead!!" pronouncements in the middle of the critical final week, HealthCare.Gov enrollment would likely have been at least 500,000 - 600,000 people higher. There's no way to prove that, of course. Between this move, slashing the period in half (from 13 weeks down to 6), the CSR mess and other sabotage moves like potentially not auto-renewing current enrollees, this November's Open Enrollment Period is gonna be one hell of a mess, that's for sure. Hell, it's even conceivable that 2018 enrollment could end up being similar to or even higher than 2017 in spite of Trump/Price pulling out all the stops to kill it off. At which point, of course, he'd almost certainly shift gears and try to take credit for "saving" Obamacare. You just know he'd try and do so.